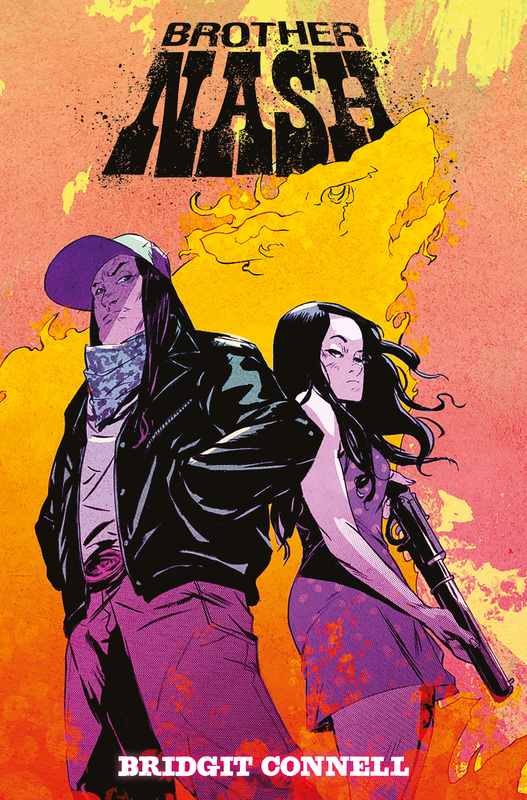 The webcomics creator discusses her upcoming three-issue miniseries from Titan Comics, her work process, Johnny Cash and more. Bridgit Connell started Brother Nash as a webcomic about a trucker forced to detour through the Southwestern United States. Connell had drawn comics and covers and cards, but Brother Nash was her debut as a writer and artist. The book attracted the attention of Titan Comics, and is now a three-issue miniseries launching in June. Connell was kind enough to answer a few questions about the book. How did you come to comics? I’ve been a fan of comics for most of my life, and have been drawing since I was a little kid. I’m drawn towards the art form because I like to create characters with a narrative that stretches beyond just a single composition. 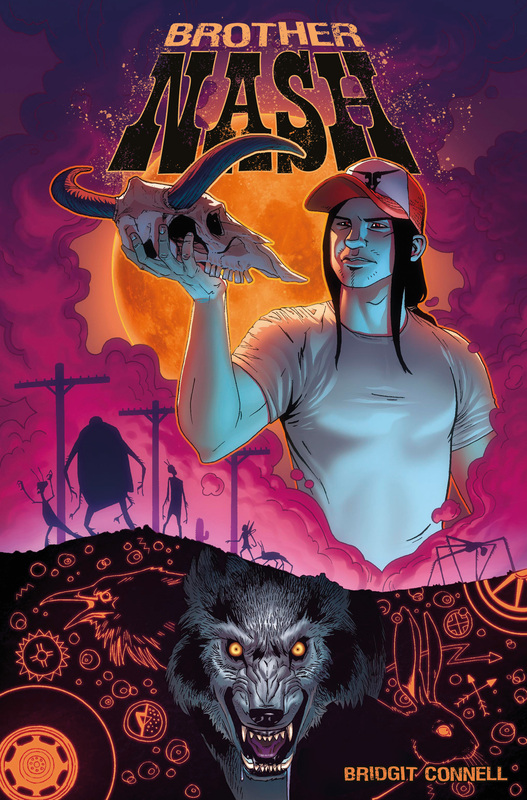 The title Brother Nash refers to the main character, a trucker named Nashoba. He is a fairly enigmatic character who we meet seemingly talking to himself at a truck stop in the beginning of the novel. Why is he a trucker? What is it about truckers? It’s just a profession that I find interesting. I wanted to write a story on the open road, in a world I wanted the characters to explore state by state. My grandfather was a trucker, and I’ve had a few friends who were truckers for a time. Just saw a lot of potential in possible characters and a traveling narrative. After reading the first issue I’m curious about where you’re going with the book. Are you building from here to tell one longer story? Is it more episodic with each issue a different tale? I created the first issue originally as a webcomic, that was only supposed to be a single story. It is a bit long as far as printed stories go. After the first issue, which is kind of a wrapped up plot within itself, I knew there was more to the story, and more to do with the characters that I had introduced. I developed a regular printed format once I created the plot for the rest of the issues. The book is set in the Southwest. What’s your relationship with the region like, because this is a book about the landscape and the history of the place. I have never been to the Southwest, ever. It’s just somewhere I find fascinating and always dream of traveling to. I did a fair amount of research, actually used maps to work out the timing and mileage with the story – I use real places, and take some creative liberties with them for sure. I even took advantage of a friend doing a cross country road trip by asking him to send me pictures along the roads he traveled to get out to California. It was a lot of fun! Talk a little about how you work. Walk us through making a page. When writing, there is a lot of breaking down the plot bit by bit. I create a concept for the book by taking into account several characters and places that I know I want to include in the story. So the book starts out in pieces, that I lay out chronologically. Once the main events are set into place, and the plot realized in a very vague way, I start diving in, imagining the scenes and filling in the details. From there I write once sentence on each page of the issue I’m working on – of 24 pages, in this case – of the main event I want happening on every page. Then I decide how many panels that event is going to take, split up the panels, and begin adding dialogue from top to bottom. The last panel of every page has some question or something just plain weird that – hopefully – will cause the reader to flip to the next one. This, I think, I learned mostly while making webcomics, to keep the reader interested every week. After the entire script is written for that issues, I start thumbnailing layouts, poses, and speech bubbles. After this I’ll pencil in the artwork, then once I’m happy with it, I’ll ink it. With Brother Nash, another layer of artwork I do right after the inks is that I’ll use grayscale marker to give it a gritty, grungy texture. 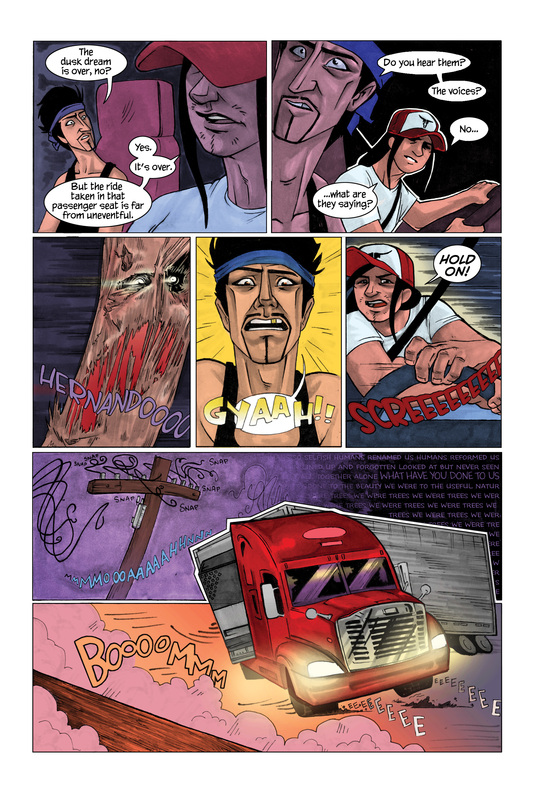 This is a comic about truckers out on the dusty open road, after all. This marker is on a separate sheet of paper. I’ll scan in the inks, and then I’ll scan in the markers. Once everything is layered, then I get to coloring it with Photoshop. Then done! You used Johnny Cash, and The Man Comes Around specifically in the book. I mean there are many reasons to use Cash and that song – because they’re awesome – but what made you use a song with lyrics from the Book of Revelations? I love Johnny Cash so much, and I know that song has been used a TON of times – which doesn’t make it any less awesome. There is something pretty wicked going on in the scene that it’s being used in, and the lyrics literally describe what’s happening from panel to panel, in a really obscure way. Plus it was a personal victory in getting the official rights to use that song in my book. That and the Ozark Mountain Daredevils in the very beginning, playing over the CB radio. It’s just something that made me really happy at the time. How did you go from making this as a webcomic to ending up at Titan Comics? I actually got messaged via Facebook by an editor that had found it as a webcomic, and liked it enough to inquire as to how I was printing it! It was really cool, and I still feel really lucky that they took an interest. Everyone at Titan has been really sweet so far – I couldn’t have asked for a cooler group of people to be printing my story!! If the book does well, is there the possibility of doing more? For sure! I have a few characters that exist that we haven’t seen yet, and Nash has a few more rounds to make in his big rig! For people who are curious and who like a good supernatural thriller, what can people expect from the comic? Give me the pitch for the miniseries. In the first issue, something is revealed that REALLY sets the tone for the world of Nash. He ends up teaming up with his friend Ray, who is a fellow trucker and bumbling sweetheart, and Billie, a strong-willed ranch-owner. Without giving too much away, there are zombie monsters, giant bug beasts, living astronomy, witches, high speed road chases with motorcycle gangs, immortal tricksters, and ghosts. And hopefully a good amount of laughs, too!